One year after Steamboat Springs was founded, a man by the name of Earnest Campbell built a house on what is now Oak street. Twelve years later, in 1913, that house was purchased by E.H. Zimmerman. For the next 43 years, the Zimmerman family lived in that house, watching the Steamboat Springs community grow into the town we know and love today. They were here in 1913, when a Norwegian man named Carl Howelsen put Steamboat on the map as a ski town. They were here during the prohibition, and witnessed the closing of the town’s saloons in 1914. They were here in the late 40’s and early 50’s and saw Olympians train in ski jumping. In 1956, the house was purchased by Routt county. Of course, the history of Steamboat Springs goes back much further than 1901. 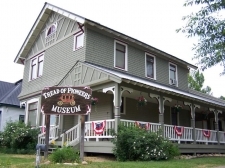 That’s why in 1959, a group of Routt county residents came together and founded the Tread of Pioneers Museum to preserve the rich history and artifacts of Steamboat Springs and Routt county as a whole. Dishwashers, electric washing machines and indoor plumbing, can you imagine day to day life without these modern comforts? What we take for granted today, people in the past would see as unattainable luxuries. Despite this, life in turn-of-the-century America was comfortable, albeit a little more difficult what today. The period-furnished rooms in the Zimmerman house are perfect examples of this. The dining room was more than just a place for the family to gather for dinner. It actually served multiple purposes; a personal office, a gathering area for guests, and a living room. That being said, it had multiple pieces of furniture to serve these roles, such as desks, tables and chairs. Back in turn-of-the-century America, the only ways to transport goods was by way of train, horse drawn wagon or a river barge. Because of this, large items like this square grand piano were incredibly difficult to ship, and had to undergo long and detrimental journeys, and were highly valued when and if they reached their destination. This particular piano was purchased in New York, shipped to California via train, then shipped again to Denver, before being freighted to Steamboat Springs by wagon in 1886. Can you imagine pulling this thing up Rabbit Ears pass in a horse drawn wagon? China plates were a valuable home accessories. Many times, a set of China would be passed down from generation to generation. Much like the dining room, the kitchen area served multiple roles. Preparing meals, cleaning dishes, and washing clothes are the main uses of this room. This odd looking device is a Maytag “Multi Motor.” believe it or not, this washing machine was considered high-tech back in 1914. Instead of electricity, this device was powered with a small gasoline engine. The engine could actually be detached and used to power other small appliances. This was an important feature, due to the fact that many areas in Routt county didn’t have electricity until the 1940s. In the age of Iphones and instant messages, the concept of electrily sending your voice across the country through a wire seems a little underwhelming. But in the days of telegrams and pony express deliveries, this concept was almost considered science fiction. This Stromberg-Carlson Telephone dates to around 1900, and were nicknamed “The Farmers Telephone” because of their supposed ability to pick up sounds in the farm yard outside. The telephone greatly improved a farmers way of life by allowing easier communication between their buyers and sellers. This bedside pot was NOT used to serve soup. This is called the chamber pot, and was used as a toilet before modern plumbing. It had to be emptied and cleaned every morning. The master bedroom. Considerably larger than the kids room. When people think about the old west, their mind immediately jumps cowboys, outlaws and sheriffs. The Western Heritage room provides a glimpse into this distinct piece of American cultural history. It features some of the iconic firearms that were carried and used by the pioneers and cowboys who settled in the area, as well as some of the tools and supplies used to survive the in the wild west. One of its most impressive exhibits tells the story of Routt County Sheriff Charles Neiman, the lawman who aprehended the ruthless outlaw Harry Tracy, who rode in The Hole in The Wall Gang led by the infamous outlaw Butch Cassidy. Firearms were a vital part of the cowboy’s inventory, they were used to hunt for food, as well as protection from the many threats found on the wild frontier, many times these threats were four legged critters, sometimes these threats walked on two legs. However , in the Routt County area was relatively safe, the local Ute tribe and the white settlers were able to coexist peacefully for years. Before repeating rifles like the Winchester and Henry Repeater, single shot rifles were used extensively. One of their drawbacks was its single shot capacity and lengthy reloading time. They did however offer astounding accuracy at long range, and were often far more powerful than the lever-action rifles of the day, making them useful for tackling lage game like moose and bear. On the top it a muzzle-loading, percussion cap long rifle. Below it is a large caliber buffalo rifle, as the name implies, it was designed to kill large game like buffalo. On the bottom is the Sharps “trapdoor” rifle which used a trapdoor mechanism to load metal cartridges at the rear instead of ramming a bullet and gunpowder down the barrel. This rifle was adopted by the U.S. Army during the Civil War and its short barrel made it a favorite of the U.S. cavalry. Six shot revolvers were carried by almost everyone in the wild west; cowboys, outlaws, lawmen, and pretty much everyone else who often found themselves in dangerous situations. The introduction of revolvers revolutionized warfare; before that many people carried a single shot muzzle loading pistol such as the one on the top right corner. Out of all the weapons used in the wild west, the Colt Single Action Army revolver is perhaps the most iconic. This pistol used metal cartridges instead of black powder making it easier and faster to reload compared to other revolvers of the time. Clint Eastwood used one in The Good, The Bad and The Ugly. General George S. Patton used one extensively in the Second World War, and countless others have relied on them until the advent of semi-automatic pistols in the early 1910’s. This particular Single Action Army was the personal sidearm of Steamboat’s founder James Crawford. James used this weapon to kill an “unusual deer” near Yampa in 1881. Harry Tracy: Outlaw. Gunslinger. Murderer. Tracy was a member of Butch Cassidy’s Hole in the Wall Gang. By the time he was a young adult, Tracy had already been involved in numerous acts of theft and robbery. Over the course of his life, Tracy killed at least 7 people, including 4 lawmen and 3 civilians. He was eventually captured by Routt County Sheriff Charles Neiman, but eventually escaped. Charles Neiman was elected Routt County Sheriff in 1895, and had a reputation of being a highly respected and skilled officer of the law. So in when he heard the ruthless outlaw Harry Tracy was in Routt County in 1898, he took no chances in hunting him down. To Neiman, this manhunt was personal; Tracy had killed one of Neiman’s deputies, Valentine S. Hoy. The Sheriff was eventually successful and captured Tracy, but unfortunately for Neiman, the outlaw managed to wound him and locked him in the jail cell with the help of an accomplice called David Lant. In doing so, the outlaws practically signed their own death warrants. Neiman and a deputy hunted the outlaws down and captured them trying to board a stagecoach in Sidney, just outside of Steamboat Springs. Neiman was now well aware of the outlaw’s tricks, and tied them up with thick iron log chains, ankle shackles (which are on display) and heavy duty padlocks. It seemed like Harry Tracy’s reputation had finally caught up to him, but the slippery outlaw still had one last trick up his sleeve. After Neiman had the pair transferred to a jail in Aspen, they managed to escape yet again, killing their guard in the process. However, Tracy’s luck didn’t last long after that. The ruthless outlaws reign of terror finally came to an end in Washington state where he found himself surrounded. Exhausted from a lifetime of running from the law, the outlaw chose to take his own life instead of being captured again. The belt of Harry Tracy and the ankle shackles used to restrain him, both of which you can see in Tracy’s photograph. Sheriff Charles Neiman’s equipment, including his badge, handcuffs and keys, and his service revolver. Long before white settlers set foot in the area, the residents of Routt County were Native Americans from the Ute tribe. The Utes were a nomadic band of hunter-gathers, and often came to the area during the summers for the natural hot springs, believing the hot springs held healing abilities. When white settlers began to arrive in the mid 1820’s and early 1830’s, the initial contact between the Utes and settlers was considered peaceful. However, as more settlers continued to arrive, periods of competitive friction began to arise. In the early 1880’s, the Utes in the area were forcibly removed by the United States military and taken to reservations. The Native American Exhibit itself contains an extensive collection of artifacts such as American Indian Weaving, beads, pottery and tools. Before the introduction of firearms by white settlers, Native Americans used spears, bows and slings as projectile weapons, and continued to use them even after guns were brought to the west. These edged stone points were the tip of a spear, which was thrown using a device called an atlatl. This brilliantly simple device provided an extension to the thrower’s arm, giving more leverage and thus more velocity to the spear when thrown. With an accurate range of 40 yards, these massive spears were used by Native Americans to hunt large game like buffalo, moose and elk. The art of archery was a skill many Native Americans were proficient at and prided themselves with their high level of skill. As mentioned before, the use of bows and arrows continued even after the introduction of firearms. However, the introduction of guns did cause a decline in archery among Native Americans, due to the fact that it took a lifetime of practice to become skilled with a bow, and only a week or two too become skilled with a rifle. These Native American artifacts were collected by Northwest Colorado proprietor H.B Pleasant and his son Richard Pleasant in the early 1920’s, before being donated to the museum in 1961 by Richard’s aunt and uncle Eunice and Farrington Carpenter.